This seems awesome, and immediately playable in all kinds of cantrip-fueled UR delver/mentor-like decks. Also, this could be among the best draw engines in the format. Does seem pretty good, though I don't know if I'd say 1 card per turn would be among the best draw engines. This seems good and worth playtesting. But you can't power it out for immediate use and it could lose a lot of utility late game when your hand is low and you draw lands. I think its more situational than you are making it to be. Ok, technically it CAN be powered out but you aren't drawing for it those turns. If you drop it turn 1 w/ a mox...its the second spell so it can't trigger. If the mox comes turn 2, same deal. If you drop mox 1 and this turn 2...well you just used your mana. You need a second mox or a free spell like probe to get use out of this. If you draw this later in the game you run the risk of mana draws and not getting 2 spells a turn. Also the wording is 'whenever you cast YOUR second spell." So its not like you can counter a spell on your opponents turn and then draw from it because that's the second spell of the turn. I think like most cards made today it wont be format changing. It will find a niche deck that it works in as utility. This is not a general purpose wrench into any deck and make it better type card. There is also the matter of deck space to consider. What are you taking out for this? Given its a 2/3 body and that has some decent value these days. It holds back man-lands and can slow down a mentor deck a smidge. Personally I see it on par with or slightly worse than mystic remora. Remora has a niche archetype it fits into. I think most often remora would be better at what you want it for but there would be enough games where this may outdraw remora. 1. Casting Cost - 1UR is playable. It's a popular color combination. 2. Body - A 2/3 for 3 is pretty boring, but it does trump hate bears or Confidant beats, so that's not irrelevant. 3. Type - Merfolk and Wizard are easily supported type in Vintage if you're going tribal, so that's good. Cavern of Souls likes this guy a lot. 4. Ability - Here's the meat and potatoes. You get a card each time you cast two spells in a single turn. That works well with Young Pyromancer, who, frustratingly, shares NO creature types with this guy! It helps out somewhat in counter wars, since you can draw into more countermagic. It's hard to see it giving you tons of gas off Moxen because it comes down at 3. If you're deploying removal or something, then fine. VERDICT: I'd try him in a Grixis list that mixes countermagic with removal and more proactive disruption like Thoughtseize, but I'm skeptical. However... I love this guy for an Animar deck. Hear me out; I once made a funny aggro deck in Vintage that did pretty well focused on Animar and creatures you could bounce for profit to grow him quickly, like Man'o'War and Shreiking Drake, and mana-production with Cloud of Fairies. I used Edric for card advantage, and Jori En might be better against decks that can block flying weenies. 1 less mana is REALLY relevant, being hybrid mana is a bit easier to cast. I'm not sure if UB is better positioned than UR, specially since sygg "demands" bolts to make a good use. Also is probably easier to draw with sygg in the midgame, since you can play it and then attack (delver, tokens...) to draw in the same turn. However, the card is drawn at the end of turn, which is worse. About drawing in the opponent's turn, chaining 2 spells with Jori En means playing a good number of spells but it's feasible. Drawing with Sygg is helped by missteps, probes, fetchlands... but without bolts is not easy to get it. That works well with Young Pyromancer, who, frustratingly, shares NO creature types with this guy! Derp, I went to check Prodigal Pyromancer instead. Please keep one thing in mind -- I think normally we forget this phenomenon: This card fuels itself, by drawing you into more spells to play. Self-contained engine cards are usually a lot more powerful than they seem in a vacuum. Jace (TMS and VP), Dack are examples of super powerful cards that were discounted for basically this reason, imo. Like, he seems like he has high "If you untap with this card, you basically win" potential. Kind of? I mean, this card does what you say it does only after you get it started. I do like that, provided you're rolling in Instants, you actually draw TWO cards per cycle off this dork; one on your turn, one on the opponent's turn. The main problem is that it competes directly with Dack. Fish decks will always prefer Edric or Selkie. Two spells on each turn seems like something that's not going to happen all that often. On their turn, it's probably only when you get in a counter fight or counter followed by EoT Brainstorm/Ancestral. Indeed, one of the best ways to play 2 spells in a row Also repeal allows similar tricks. SDT means a consistent spell in your own turn, half a card for 1 mana. Being 3cc puts it quite high on the mana curve for decks with lots of cheap spells, meaning that it will be played often with few cards in hand. So maybe it's not as good in a delver deck than in a mentor deck, for example. I like this guy as a miser copy in decks that are already running these colors like pyromancer. Worst case is that it winds up being force food in most games, but I can easily imagine games where not only does this get in some incidental damage but also draws you a new grip with him. I mean with cards like gush, counters, ancestral, brainstorm, and bolt already in the list it's not as if you have to go out of your way to activate the ability. You dont even have to resolve the spell, just trigger off casting. I think if you try to build around him like a engine you will fail because she is very vulnerable and a legend, but as an incidental beater with massive upside I can see it working. 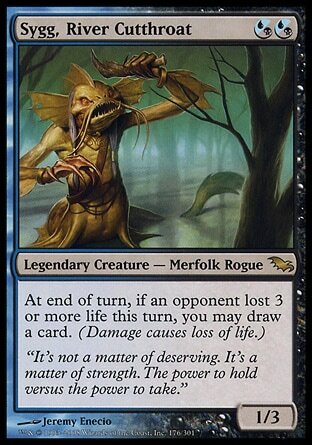 Probably, those cards are baller, but this guy does have a big leg up because he's a Merfolk Wizard. It's easy to construct an instant-heavy fish deck using those archetypes, so you can abuse Caverns. And, while he's neither bolt-nor-REB proof, at least he dodges early sweepers like Pyroclasm or Slice and Dice. So it's an Ophidian that doesn't need to use the combat step, or a Dark Confidant that doesn't affect your life total. I think this will be the biggest Eternal-impact card in this set. I'm pretty sure it's good enough to see play in both Vintage and Legacy and might just have an even bigger, Snapcaster-esque, impact than we all think. Completely free card draw is a rare commodity that can't be taken lightly. Well... I mean, it's not FREE. We've had stuff like Heartwood Storyteller that also potentially draw you cards "for free" at 3 mana but no one plays those. This guy needs a little bit of gas to get going initially. Big difference between a blue card with a 1UR mana cost and a a green card with a 1GG mana cost in Vintage and Legacy. Also, huge difference in counting on opponent to actively do something for you to draw a card (remember, giving opponent the choice is usually bad in these situations) and just drawing cards while already doing things you'd otherwise be doing anyway (playing spells, and multiple spells in one turn). She is really really good. Like Jace, Vryn's Prodigy, if she was pushed just a little more she would be absurdly broken. Were she a 2/2 for three mana, she would probably not be playable. As is, she is very good. We shouldn't underrate the value of a 2/3 with a really good ability in a format saturated with 2/1s with really good abilities. The ability to hold off slightly buffed monk tokens, Young Pyromancer, Thalia, or Phyrexian Revoker makes her an extremely strong play in those matchups. Usually one has to decide between using mana to play a creature like Pyromancer or a card advantage effect like JVP or Dack Fayden or a draw spell. Jori's ability to both hold off attackers and draw cards is very powerful. Against durdling blue opponents, she can present a clock while at least cycling and often threatening to take over the game. She can advance or retard tempo all the while drawing cards. That combination is rare, and well worth paying three mana for. Keep in mind in something like Merfolk that she is rarely going to be a 2/3 but more likely out of bolt range with a lord on the table. Being able to draw free cards in a deck like that with an on tribe creature seems well worth meriting a good look at that list again. -Hatebears: probably the best matchup. Getting advantage while defending from bears can be game winning. -Mentors: another matchup where you want Jori. It provides a 2/3 body means she can block mentor or tokens unless opponent has played something. In the meantime, she generates card advantage (while mentor generates board advantage). I'm not sure if Jori generates more advantage than mentor, but that's another question. -bomberman, painters: Jori can likely neutralize the small clock those decks have, but it's own clock can be neutralized. Jori helps in the control role, getting card advantage to avoid opponent's combo. Interesting indeed, but I don't know if she will be a bit late against explosive versions. -doomsday, tezz, storm: even if she can connect several times doomsday should combo over her all day long. Against those explosive decks you will probably perform the passive control role (or desperate aggressive mode) so the 2 spells per turn are harder to achieve. Besides she can be too slow. -dredge: slow, too slow. she can chumpblock few times in order to survive 1 extra turn, which is nice. -mud: she can block revokers and not-pumped factories. 3cc can be tough against spheres, playing 2 spells per turn feels really hard and most creatures trump it. -oath: she looks bad, like most creatures. The ability seems harder to trigger than it looks. What is the EV out of her per game? Because I would think its maybe 1. A 2/3, 3cc creature that says draw a card at the end of your next turn doesn't sound great to me. There are decks like gush where this is much better, but I don't think it just gets thrown into every red/blue shell out there. it's not very hard to trigger this the turn she comes down, fyi. Turn 2 or 3 Jori -> Mox or Gush is a potent sequence. That seems like a very rare occasion. Remember, this gal costs 3 mana. Putting down your Mox or Gushing+replaying a land is a very common way to GET to three. I can't see someone nerfing their own development for a turn just to use this card. also a really good T2-3 play against removal. T2-3 Jori -> win a fight over a bolt/swords and draw a card and keep her in play is superb. If somebody plays bolt/stp after you played this and nothing more, providing you have several unknown cards, is playing badly. Not if you're tapped out because you decided to spend 3 mana on this dork. So to be a very good card on turn 2 you basically need 2 lands, this card and 2 other free spells one of which has to be a mana accelerator in your opening 7 (plus you get 1 or 2 draws depending first or second). Yes, that happens and is not that uncommon. But is it so common that you would bank your turn 2 play on it? Turn 1 land/mox (sol ring, mana crypt). Turn 2 land this. Then another spell. But you've used all your mana. So you either need a probe or another mox or lotus or have a sol ring/mana vault if you had an extra floating colorless. If you go second and get this turn 2 you just dedicated 55% of your opening hand to drawing 1 card. The times you get a gush to use as your free spell will not be often enough to count and then you are setting yourself back 2 lands. As for the arguments that this can help recover after a counter war or is extra draw with tricks like snapcaster/spell in graveyard or repeal/mox - I still think other cards can do the same thing only better. I take back what I said above about coming it to mystic remora. As far as card draw potential goes remora is head and shoulders above this. On your opponents turn if you fight a counter war with remora out you are drawing 2 cards or more. With this fish you are drawing one. On your opponents turn if he plays 2 spells and you don't play any with remora you are drawing 0-2 cards with this fish you are drawing 0. The fact that this is on a stick has its benefits and I'm not ignoring them. But as a card drawing engine I really think this falls short of the standard needed to be T1 viable. I think you need to think about her in the context of what deck she could wind up in. I go back to Merfolk once again, a deck that now has plenty of space because of the restrictions of DDT and Cruise. The utility you lose in some matches to play a copy of this over lets say a Phantasmal Image is pretty low, but the upside is potentially very high. I'm not sure Joel Lim's list is the best place to start since it has been 2+ years now, and maybe Aether Vial has a place again of if you stick with the null rod plan, but I think I could easily imagine a singleton of this in the deck and them perhaps some more aggressive tempo cards?